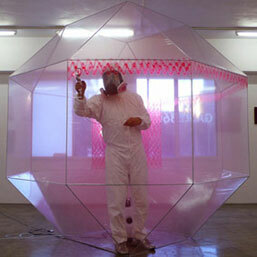 Painter and performance artist puts his very lifeline into his artwork. Heartbeat Drawing Sasaki "Something with Instinct"
Heartbeat Drawing Sasaki is an artist whose artists name succinctly describes the nature of his existential endeavor. Put simply, he draws heartbeats. His red, wavy lines rise and fall to the persistent hypnotic beat of a heart, his heart. He draws them on aluminum, and he draws heartbeats on paper, every day, with the results stacking up as monuments to time. He paints heartbeats in a narrow line on the walls of white washed galleries and onto free standing structures as part of performances. Involved with projects all over Japan he is becoming an increasingly well-known artist with exhibitions and events hosted in locations across the globe (London and China so far, and Switzerland next year) Part showman, part explorer and collaborator he remains focused on recording a trace of life, capturing the very fact of existence in a format that although stylish never seems intentionally minimal for the sake of effect. 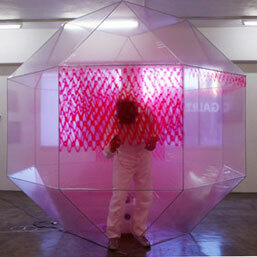 In the smart, compact space of Gallery 360°, a large polygon of transparent, ziplocked plastic dominates the room. To one side, a small version of the same shape in a deep red tone, balances precariously on a thin metal strip that juts from the wall. The walls are covered with a variety of paintings in red and silver. The paintings are both dense and modulated with a surface that seems to both ripple and hover. Created by painstakingly spray-painting onto canvas and aluminum over a period of one to three hours (depending on the size) they are the trace of a movement, a record of a moment lived. “To be conscious of the beat is to feel ‘life’ itself.” With the individual marks like microscopic moments lost in the dense surface of the paint, the works can be read as metaphors for the collectivity of the past and both the particularized and generalized ways in which we remember it. Inside the polygon, Heartbeat ‘transcribes’ the rhythm of his heartbeat in real time, spray-painting it with a device reminiscent of some kind of medical instrument, the sound of his heart and the sound of the pump filling with new pigment merge to form a deep and resonant beat. Silver booted, wearing white overalls, sporting a sharp haircut and an industrial protective mask he looks part stunt man, part decorator and part eccentric genius. 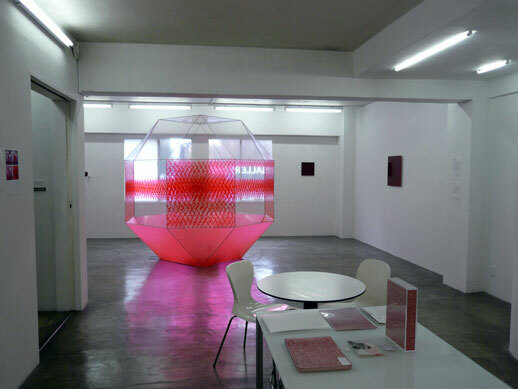 The performance aspect of the work makes the whole experience of the show an unusual synthesis of process and product. This is a deliberate art that seems to be a combination of conceptual and performance art. Each of his shows builds on the next, extending the central mytheme into a new story. In Beijing, visitors were invited to take a Polaroid photo and draw their own heartbeat for a one-minute period. Activity of this kind pushes his art away from being simply an inert product to a more interactive model that engages. Extending his activity into online space as well, he invites people to send in postcards of their heartbeats. This project will result in the visual representation of not just an individual heartbeat but the combined heartbeat of a whole plethora of people; it is the ultimate cyber timeline or the ultimate art beat, if you’ll excuse the pun. The paintings in this exhibition are two dimensional vitrines on the fragility and vitality of life. His performance and the 3D record of his movements re-emphasizes the fact that for contemporary artists hybridity is no barrier to a concise and meaningful action.